We are open by appointment Friday to Sunday from 11 to 5. We are also available other days/times in advance and during most industry-wide event weekends. Give us a call at (805) 365-3000 or use our BOOK APPOINTMENT button above to schedule an appointment to visit us here at the winery. Our booking tool requires a day in advance booking, but we're here often so please give us a call to schedule a spontaneous visit - you just might catch us! If we're not here, leave us a message and we'll get back to you as soon as possible. Just 17 minutes/about 8 miles southeast of downtown Santa Margarita. From downtown Santa Margarita, go to the east end of town, past Dunbar Brewing, to Estrada Rd (GO RIGHT) which turns into Pozo Rd. Take Pozo Rd about 3 1/2 miles to Las Pilitas Rd (GO LEFT). 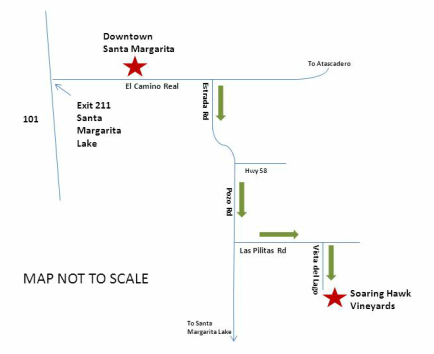 Then go 2.9 miles to Vista del Lago (GO RIGHT). Then follow the signs about 1.5 miles to the winery building. PLEASE NOTE THERE IS A 15 MPH SPEED LIMIT ON VISTA DEL LAGO - BE KIND TO OUR NEIGHBORS AND WILDLIFE!